Antibiotic resistance of strains of Staphylococcus aureus isolated from bovine milk is of concern internationally. The objective of this study was to investigate trends of resistance of S. aureus to antibiotics administered to dairy cows in 19 South African and one Zambian dairy herds (participating in the South African proactive udder health management programme) and to identify possible contributing factors. The resistance of S. aureus strains to eight commonly used antibiotics in South Africa from 2001 to 2010 was evaluated. 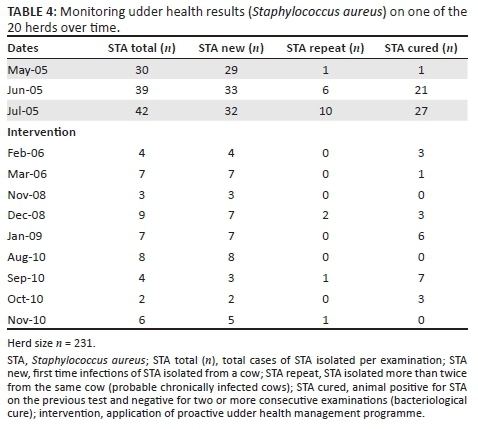 Staphylococcus aureus isolates (n = 2532) were selected from cows with subclinical mastitis in 20 herds routinely sampled as part of the proactive udder health management programme. The isolates were selected from milk samples that had somatic cell counts more than 400 000 cells/mL and were tested for antibiotic resistance using a standard Kirby-Bauer test with published clinical breakpoints. The prevalence of antibiotic resistance was evaluated as a percentage of S. aureus isolates susceptible out of the total numbers for each antibiotic selected per year. Staphylococcus aureus showed a significant increase in percentage of susceptible isolates over time for all antibiotics tested except for ampicillin. The overall prevalence of mastitis did not change during the study period. However, the prevalence of mastitis caused by S. aureus (mostly subclinical cases) in the selected herds decreased numerically but not significantly. Reduction in the incidence of antibiotic resistance shown by S. aureus was presumed to be a result of the application of the proactive udder health management programme. The fact that the overall prevalence of mastitis was kept stable was possibly because of the influence of the management programme in conjunction with the return of infections caused by non-resistant strains. South Africa is a developing country in southern Africa. With a population of 55 million people, the average annual milk consumption has been estimated to be approximately 36 L of milk per capita, which is well below the 200 L per capita annually recommended by the World Health Organization (Lassen 2012). Currently 98% of the country's needs is locally produced, with approximately 10 million litres being imported (Lassen 2012). The South African milk-producing herd was estimated to be approximately 2474 dairy herds in 2012, with an average herd size of 238 and an average production of 20.2 L of milk per cow per day (Milk South Africa 2013), either using thrice or twice daily milking routines. Over the last 10 years, the number of milk producers has decreased, with an increase in average herd size (Milk South Africa 2013). The infected udder is considered the primary reservoir of S. aureus and it is believed to be transmitted during milking via contaminated teat liners, milker's hands and communal clothes (Leslie & Schukken 1999). Once S. aureus infects the udder, it may cause primary clinical signs such as swelling, heat, redness, and floccules in the milk as well as abscessation and fibrosis of the udder. These bacteria may damage the secretory tissue and cause reappearance of clinical signs or elevated SCCs and may permanently limit an infected quarter's ability to produce milk and to respond to treatment (Mellenberger & Kirk 2001). Staphylococcus aureus is also particularly difficult to treat effectively because it may secrete β-haemolysin, which can lead to potentially fatal gangrenous mastitis (Mellenberger & Kirk 2001). These bacteria can also avoid phagocytosis through biofilm production, which may also lead to poor antibiotic penetration (Ramadhan & Hedges 2005). The production of biofilm may also be correlated with pathogenicity and thus contribute to the virulence of individual strains (Ramadhan & Hedges 2005). In practice, herds were sampled as frequently as possible with all cows that tested positive for S. aureus placed in a separate camp and milked last within 2-3 days of sampling. These cows were kept in the camp with other S. aureus-positive cows for the rest of their productive lives. At drying-off, cows would be removed from the herd and placed in a separate group, but returned to the group immediately after calving. The positive cows were identified differently in order to facilitate immediate identification should they be in a wrong group. They were always milked last and only after the rest of the lactating cows left the parlour, for their entire productive lives. Udders of all S. aureus-positive cows were palpated by an experienced veterinarian just after milking to determine possible chronic udder damage. In addition, the following criteria were used to predict the probability of cure for the individual cow: parity, stage of lactation, level of SCC in the infected quarters, numbers of quarters in an udder infected with S. aureus and quarter position according to a suggested formula (Sol et al. 1997). For example, there is a decreased likelihood of cure of cows in second or later lactation, within 1-99 days in milk, with high SCC (> 800 000 cells/mL), with mostly hind quarters affected and 3-4 quarters per udder affected (Sol et al. 1997). Selection of the antibiotic for treatment was based on antibiotic susceptibility testing results and cure based on culture results instead of the SCC. Microbiological cure was monitored and chronic cases were culled as soon as possible. Milking hygiene practices included disinfection of milker's hands or gloves that actually touched the teats (performing stripping), pre- and post-teat dipping and backwashing of clusters with effective and fast-acting disinfectant. Routine bacterial isolation (National Mastitis Council 2004) was performed on all milk samples in accordance with standard laboratory milk culture methodology and preliminary identification was done based on colony morphology (International Dairy Federation 1985). When fewer than two colonies were present, and no organism was identified, the milk sample was noted as 'no growth'. When there were more than two types of organisms present, the sample was noted as contaminated (CU). Where there were two distinct groups of separate growth present, this was noted as 'mixed growth' (MG) or a special code was allocated when major pathogens were involved. Samples classified as 'no growth', CU (contamination) or mixed growth (with or without major pathogens) were not used for antibiotic sensitivity testing. The SCCs were performed by fluoro-optic-electronic methods using a Fossomatic 90 and Fossomatic 5000 (Rhine Rühr, Wendywood, Denmark). 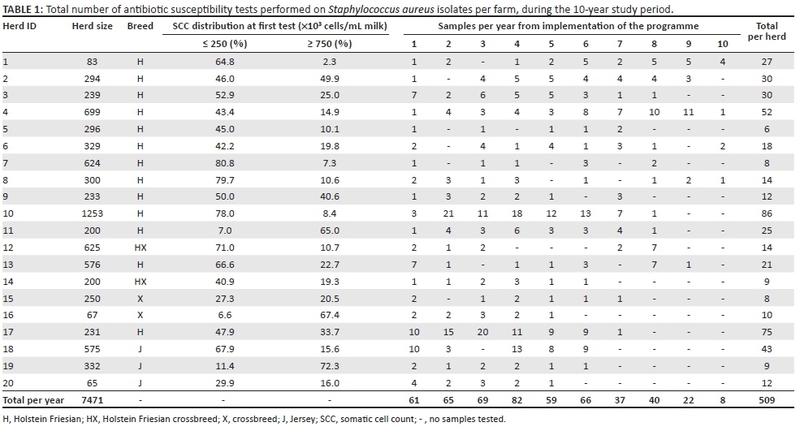 Selected isolates of pure cultures of S. aureus with vigorous growth from subclinical mastitis cases with an SCC of more than 400 000 cells/mL were utilised for susceptibility testing. Not all S. aureus isolates in the herds over the 10-year study period underwent susceptibility testing (the routine practice is to perform one susceptibility test per type of bacteria isolated per investigation). Antibiotic susceptibility testing was performed on one S. aureus isolate for every herd investigation, using the Kirby-Bauer disk diffusion method (Bauer et al. 1966) for eight antibiotics with laboratory quality controls (American Type Culture Collection - ATCC No. 25923 S. aureus): ampicillin 10 μg (AMP), cloxacillin 5 μg (OB), penicillin G 10 IU (PEN) (beta-lactams); cephalexin 30 μg (CL), cefuroxime 30 μg (CXM) (cephalosporins); clindamycin 10 μg (DA) (lincosamides); oxytetracycline 30 μg (OT) (tetracyclines) and tylosin 30 μg (TY) (macrolides). Antibiotic susceptibility testing was performed and interpreted by measuring the zone diameter to the nearest whole millimetre for all zones of inhibition, which were categorised as susceptible, intermediate or resistant categories as clinical breakpoints established by the Clinical Laboratory and Standards Institute. The commercialisation of antibiotics in the 1940s has revolutionised medicine in many respects with many lives having been saved. However, the overuse of these once highly effective antibiotics has been accompanied by the rapid selection for resistant strains of bacteria (Davies & Davies 2010). A recent WHO health report has warned that resistance to antibiotics in general is a 'global' threat (World Health Organization 2014), and one that impacts both human health and the agricultural industry. The exposure of humans to antibiotic-resistant pathogens through agricultural products and contact with animals has increased from the beginning of the 21st century (Kluytmans 2010). This is noteworthy when compared to previous historic exposures that were limited to hospital nosocomial infections (Witte 1998). Of the various veterinary uses of antibiotics, our concern has been the high levels of resistance seen in mastitis-causing organisms in South Africa. The resistance of S. aureus to beta-lactam antibiotics in a limited study carried out in the KwaZulu-Natal province has been found to be 48% during this same monitoring period (Schmidt 2011). However, this cannot be compared with our results because of the limited data upon which the KwaZulu-Natal study was based. However, a numerical decrease (non-significant) in mastitis caused by S. aureus was shown in a few of the examples from these herds (Table 4). Another South African study showed the overall trend of mastitis increasing from 8.1% in 2002 to 15.4% in 2006 from all routine samples during that time period (Petzer et al. 2009). However, the 20 herds in this study, with continuous evaluation and correct application of this management programme in practice (at 1-4-month intervals) for the 10-year study period, showed an overall stable prevalence of mastitis (Table 3). Only a significant reduction in the prevalence of antibiotic resistance in S. aureus was found (Table 2). This highlights the possibility of being able to farm successfully using less antibiotics for milk production. This management programme works well only when the information obtained is put into practice correctly. While the significant decrease in the resistance is an important finding (Table 2), it is not suggested that bacterial resistance can be reversed, but rather that the improved udder health management had naturally selected for less resistant/pathogenic strains of S. aureus. Therefore, we believe that the S. aureus strains that were identified in milk samples from these herds were being effectively removed from the infectious cycle (Table 4). This was done by successful and early treatment of both subclinical and clinical IMI, inactivation of quarters or culling of cows. The risk of new infections by these bacteria was also limited by isolating infected cows, by milking them last and by improving milking hygiene. This was based on the epidemiology of S. aureus mastitis strains, which appear to come from both other cows and humans. The rationale for this was that the chronic S. aureus-infected animals were repeatedly infected animals that failed to respond to treatment, thus likely representing the reservoirs of resistant pathogens. It is also plausible that good hygiene limited the spread of S. aureus from the farm workers to the animals. In more than eight previous S. aureus outbreaks in the country, a link has been shown between bacteria isolated from throat swabs of dairy parlour staff and from cows' udders (Petzer et al. 2009). The change in bacterial population resulting from good biosecurity measures is not an unknown phenomenon. The best examples come from intensive care units of hospitals that have implemented good hygiene practices (Sydnor & Perl 2011). In one medical study, a 9% year-on-year decrease in methicillin-resistant S. aureus (MRSA) cases was reported (Kallen et al. 2010). These medical studies have illustrated how the resistance profiles of bacteria can change under intensive care unit biosecurity programmes. As for the reason for the change in resistance (Table 2), this is most likely because of a replacement of the more resistant pathogens with environmental or 'wild type' strains of bacteria that are not yet antibiotic resistant. The term 'wild type' refers to the phenotype of the typical form of a species as it occurs in nature. Originally, the 'wild type' was conceptualised as a product of the standard 'normal' allele at a locus, in contrast to that produced by a non-standard, 'mutant' allele, typically without resistance (Merriam-Webster's Collegiate Dictionary 1999). The environmental pathogens are more genetically diverse and able to colonise environments in which the pathogenic organisms have been removed. While we have not yet characterised the change in phenotype of the organisms over time, the resistance profiles found after the 10-year period were very similar to the results of the South African National Veterinary Surveillance and Monitoring Programme for Resistance to Antimicrobial Drugs (SANVAD) report (Van Vuuren, Picard & Greyling 2007), which indicated surprisingly low resistance of S. aureus among South African dairy cows to the classes of antibiotic tested. In the SANVAD results, the greatest antibiotic resistance was recorded for gentamicin, ampicillin and enrofloxacin. In spite of this fact, 12.4% of isolates were multi-resistant, with most of them being resistant to ampicillin (Crestani et al. 2016; Van Vuuren et al. 2007). Ampicillin was the only product used in this study which did not show a significant decrease in antibiotic resistance over the study period (p = 0.104) (Table 2).